I’m in Charlotte North Carolina for a while. 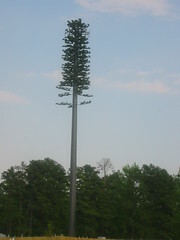 I nearly missed ‘seeing’ this cellular tower because of its cunning camoflage! The give-away clue is mainly that it is much taller than surrounding trees. It’s very near the University of North Carolina at Charlotte (UNCC). Have you seen any cunningly disguised cellular towers?